When 3A Composites USA launched its “Legends” marketing communications campaign in 2004, company executives reviewed a wide field of internationally recognizable graphic arts icons to be recreated in print advertisements with one of the company’s leading graphic display boards, including those in the Sintra®, Dibond®, Gator™ and Fome-Cor® board lines. Choices included everything from the Eiffel Tower in Paris to New York City’s Statue of Liberty and Charles Lindbergh’s Spirit of St. Louis transatlantic record-setting airplane. But when the company recently expanded the “It’s What Legends Are Made of – Create Your Own” program to include a Spanish-language ad specifically targeting graphic designers in Mexico and other Central American countries, one clear choice stood out for the area’s most recognizable graphic arts icon – El Castillo, the Mayan temple of Kukulcan in Chichen Itza, Mexico. This well-known Mayan pyramid, built of stone in approximately 800 A.D., stands 24 meters tall to a platform that supports a two-story temple measuring an additional 6 meters in height. 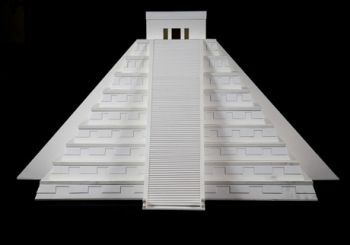 El Castillo’s design is thought to relate to the Mayan calendar, according to the www.world-mysteries.com web site. According to the site, each of the pyramid’s four faces incorporates a broad, steep staircase consisting of 91 steps. Counting the top platform as an additional step gives a total of 365 steps – one step for each day of the year. According to www.world-mysteries.com, one of the more unique aspects of El Castillo’s design occurs at the spring and fall equinoxes, when the sun projects an undulating pattern of light on the northern stairway for a few hours in the late afternoon. (This pattern is caused by the angle of the sun and the edge of the nine steps that define the pyramid’s construction.) These triangles of light lead to stone carvings of snake heads at the base of the stairs, creating the appearance of a slithering serpent. To create these effects, the ancient Mayans had to be exacting in their design and construction. So, when 3A Composites recreated El Castillo, it selected Sintra graphic display board, the trusted brand leader, as a substrate that would accommodate precision cutting and fabrication requirements. 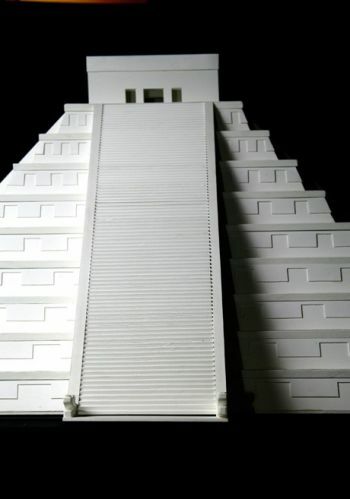 “Because El Castillo is one of the most well-known and preserved Mayan pyramids, we believed that a scaled reproduction of this temple would be well-received in the Central American market,” said David Meacham, regional manager, Central U.S. and International, Alan Composites USA. “We also were sure that Sintra was the best material for creating this display because it can be formed into virtually any shape using wood and foam board fabrication techniques. Sintra is a lightweight-yet-rigid expanded PVC material that is available in a wide range of thicknesses from 1 mm to 19 mm in various sheet sizes and a rainbow of colors. Sintra cuts cleanly, creating smooth edges. It can be direct printed and accept vinyl graphics. Sintra fabricates easily without special tools and can be heat formed and laminated to other materials. David Kuijt, adjunct professor of computer science at the University of Maryland’s University College in Rockville, Md., was contacted to recreate El Castillo. 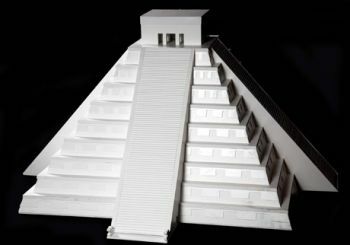 As an avid De Bellis Antiquitatis (DBA) war gaming enthusiast, Kuijt previously had created a scaled Aztec pyramid to be used with a 15 mm Aztec army in a DBA game. Kuijt also had a background in woodworking, reproducing medieval furniture. 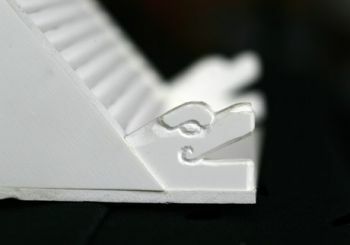 While he’d worked with 3A Composites USA’s Fome-Cor board – the original foam-centered graphic display board consisting of extruded polystyrene foam bonded between two white, clay-coated papers – he’d never worked with Sintra when he was asked to bid on the El Castillo display project. To start, Kuijt began researching El Castillo on-line and through the University of Maryland’s architectural library. He also was able to access a set of plans of the Chichen Itza archeological site from the Carnegie Institute. Kuijt estimated that he would need six sheets of 4-foot by 8-foot white Sintra in four thicknesses, including 1 mm, 4 mm, 10 mm and 13 mm, to reproduce El Castillo. His materials’ estimate had to be accurate in order to meet 3A Composites’ tight deadline to have the display ready for shipment by Aug. 1 to imageWorld™, Mexico’s leading trade show for the sign-making, screen-printing and digital-imaging industries, held Aug. 17-19, 2005, in Mexico City. Kuijt also soon discovered that he would need a new plastic-cutting table saw blade, which he ordered from Forrest Manufacturing Co., Inc., in order to make long, precise cuts in the Sintra material. Kuijt has provided a detailed on-line chronicle describing the 35 hours he spent constructing the scaled pyramid at www.umiacs.umd.edu/~kuijt/dba105/Castillo/Castillo.html html starting with the base and vertical walls. Most pieces in the pyramid were cut with the table saw. The corners of the sloped walls were cut by hand with a jig. 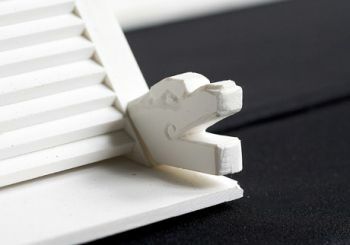 Architectural details, including two Kukulcan serpent heads, were hand cut with an artist’s knife. Pieces were glued together with PVC cement. “I really liked working with Sintra because it cut precisely with the table saw blade,” said Kuijt. “And, with Sintra, I was able to whittle the Kukulcan heads in half an hour and also use hand saws and a plane with great Additionally, Kuijt felt that Sintra provided enough strength and rigidity to allow the detailed pyramid to hold up well during repeated shipments and installations at trade shows. In total, Kuijt estimates that the scaled reproduction is comprised of 546 pieces, all cut from Sintra graphic display board. It weighs approximately 80 pounds and measures 46 inches wide at the pyramid’s base (including staircases) and 23 inches tall from the base to the top of the pyramid’s temple. To complete the project, Kuijt built a custom crate with wood supports and plywood walls that was designed to protect the pyramid during shipment. Attendees of the imageWorld trade show in Mexico City were among the first to view the scaled reproduction of El Castillo, and they weren’t disappointed, according to Meacham. “People immediately recognized El Castillo and were amazed with the amount of detail depicted in the replica,” said Meacham. “Several visitors to our booth photographed the display, and we had to turn down at least one offer to sell it! It was definitely an attention-getter that stimulated booth traffic. People seemed to be drawn to El Castillo because it showcased Sintra’s versatility in creating three-dimensional designs.